Sumkali is Michigan's premier Indian music fusion group comprised of award winning musicians, including a Grammy Award winning harmonica master Peter Madcat Ruth. 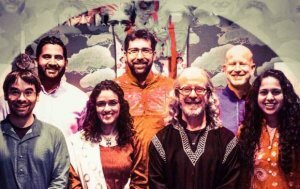 Celebrating the 2018 release of their 4th album titled "Dha Re Dha", Sumkali brings a collective of musicians from all over the world that come together to create a unique blend of Indian folk music with American folk, blues, and jazz. Sumkali formed in Ann Arbor in 2003 when musicians came together for an informal Indian Music Night hosted by the Crazy Wisdom Tearoom. Since then they have recorded four albums, performed hundreds of shows, festivals, private events, Indian festivals, weddings and more. The group is a collective of musicians from all over the world that has found a way to break through musical boundaries. As part of their mission, they also do outreach to schools, universities, and community education programs to educate and inspire students to celebrate diversity and understanding amongst people.